Free, prior and informed consent (FPIC)—the decision to allow mining and the negotiation of mining agreements are arrived at in a fair manner, following the principles of FPIC. Stakeholder identification—customary owners and other stakeholder groups are properly identified and written into the various sections of an agreement with accuracy, clarity and safeguards to ensure that recognition shifts do not occur over time. Agreement governance—processes are specified, and their costs underwritten, that ensure: benefits (royalties, compensation for loss, lease payments, employment, business spin-offs, improvements to local infrastructure, commitments to social programs) will be appropriate and divided fairly among stakeholder groups; beneficiaries receive what the agreement says without hidden transaction costs throughout the mine life; there are appropriate protections for vulnerable people; monitoring and evaluation is carried out to professional standards; and reviews are held following an agreed timetable and to the same standard as used in the original agreement-making process, or better. Bougainville’s population in 2016 is approximately 300,000 (less than 4 per cent of PNG’s total population). 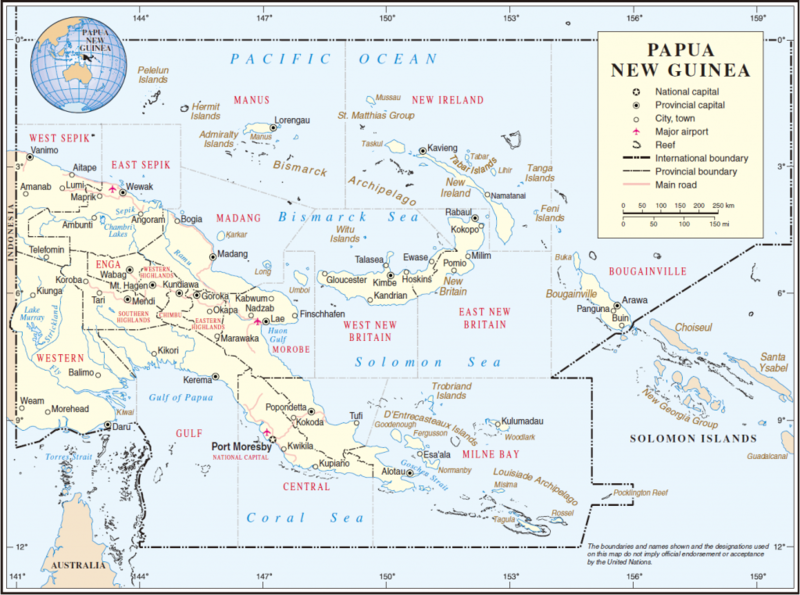 Its 9,438 square kilometres is roughly 2 per cent of PNG’s total land area. Pre-colonial Bougainvilleans were organised mainly around tiny stateless societies involving great diversity in language, culture, and identities. Despite major social and economic changes since colonial ‘rule’ began in the late nineteenth century, the most significant social groups today continue to be nuclear and extended families, the localised clan-based landowning lineages to which those families belong (typically containing 50–150 members), and flexible groupings of such lineages. Archaeological evidence of humans on the island of New Guinea has been dated to approximately 50,000 years ago. Spanish and Portuguese sailors sighted the land in the early 16th century. The Dutch claimed the western half of the island in 1828 as part of the Dutch East Indies. There was some limited foreign exploration of the eastern half of the island in the 19th century, and a few settlements made. In 1884, Germany annexed the northern parts and Britain proclaimed a protectorate over the southern parts, which were formally annexed by Britain in 1888 and became British New Guinea. While intra-parliamentary disputes, arising from unstable political alliances and leading to frequent changes in government, are a typical and seemingly intractable feature on Papua New Guinea’s political landscape, the nation has also experienced extra-parliamentary political strife in recent years. Between 1989 and 1998, the principal dispute, centered on the island of Bougainville, reached the stage of armed conflict. Bougainville is the larger of two offshore islands that make up Papua New Guinea’s North Solomons province. In the late 1980s, landowners on the island demanded compensation from Australian-owned Bougainville Copper Ltd. for environmental damage caused by mine operations. A guerrilla force, the Bougainville Revolutionary Army, or BRA, led by Francis Ona, initiated a sabotage campaign when compensation talks reached an impasse. The Papua New Guinea government then sent security forces to the area; the BRA countered by increasing its demands, including secession from Papua New Guinea. The conflict escalated, with the national government offering a reward for Ona’s capture or death. Australia announced it would send forces into Bougainville to evacuate its nationals. The Papua New Guinea government negotiated a cease-fire in March 1990 and withdrew forces from Bougainville. The upshot was that the BRA took effective control of the island, whereupon the government imposed an economic blockade. Fighting continued between the secessionist BRA and the Papua New Guinea government for several years despite numerous attempts to achieve a negotiated outcome. The question, why have parties not developed, implicitly assumes that political parties are an inherent part of a parliamentary system. Certainly, the process of majority decision-making encourages groups of like-minded members to come together to ensure the numbers necessary to push legislative agendas, and when there are significant lines of social cleavage — class, ideology, ethnicity, religion, region — and corresponding clearly differentiated collective group interests, these might form a natural basis for party organisation. This has been the history of political party development in most developed nations. But it does not describe politics in PNG. First, as Hegarty has argued, PNG lacked the galvanising influence on politics of an independence struggle, through which parties have often been defined elsewhere, and, after the early differences between Pangu-NP and UP over the speed of transition to independence became irrelevant in 1975, party platforms, as we have seen, tended to converge. Class has not emerged as a major social cleavage in a country where about 85 per cent of the population is at least partly involved in subsistence agriculture and even the urban elite tend to retain their links with the village. Undoubtedly, there is a growing gap between rich and poor, but Western class models are largely irrelevant in explaining the dynamics of economic inequalities in PNG. Regionalism has had more impact on PNG politics, especially in relation to a continuing Papuan identity, but it has not provided a systematic basis for party organization. Indeed, to achieve office, all coalitions need to put together a group representative of all four regions, and this to some extent cuts across regionalism as a base for party organisation. In the absence of such social or geographic cleavages, collectivities have developed primarily from personal networks. Since politicians also compete for office, these personal networks are typically fragile, especially among aspiring leaders. Author SamPosted on 2015-06-29 2018-01-23 Categories EncyclopediaTags PoliticsLeave a comment on Why has a coherent party system failed to develop in PNG? In the latter half of the 1990s, there was considerable dissatisfaction within PNG about the country’s lack of social and economic progress and growing problems of lawlessness and corruption, and growing criticism from outside. On becoming Prime Minister, Morauta vowed to address these issues and ‘to restore integrity to our great institutions of state’. A major plank in his government’s reform platform was an Organic Law on the Integrity of Political Parties and Candidates (OLIPPC). A secondary measure was an amendment to the Organic Law on National and Local-level Government Elections to change the electoral system from one of first-past-the-post voting to one of limited preferential voting. In each national election in PNG since 1972, there has been a steady increase in the number of candidates contesting, notwithstanding an increase in the required fee for candidature in 1992, from K100 to K1,000 (then roughly equal to per capita GDP). While some of these candidates might have been put up to split the local vote of a rival candidate in another clan or another part of the electorate, with voter support being localised there are often several candidates with a good chance of winning if they can hold their support base together. There has also been a fairly steady increase in the proportion of candidates who have stood — at least overtly — as independents. These developments have had at least two adverse effects on elections: first, with the number required for victory sometimes relatively small in open electorates with many candidates, holding one’s bloc together is critical, and this has encouraged voting irregularities and violence in parts of the country, especially in the Highlands. In 2002, this caused the declaration of failed elections in six of the nine electorates in the Southern Highlands. Secondly, with many candidates competing, the percentage of the total vote that winning candidates have obtained has been, on average, steadily falling. Concerns about these issues lay behind the OLIPPC. It is impossible, within a short space, to detail the constant comings and goings of members, defecting from one party and joining another, sometimes only temporarily, and the constant wheeling and dealing among party leaders seeking to advance their party’s interests or their own ministerial aspirations through the formation of new coalitions or the preservation of existing ones. The brief history conveys something of the flavour of party politics in PNG and provides a broad context within which some of the particular characteristics of political parties and the ‘party system’ in PNG can be highlighted. In November 1951 the colonial Administration established a Legislative Council of 25 appointed European members (public servants, planters, businessmen and missionaries) and three appointed PNGan members. The Council was restructured in 1961 to include more PNGan members. The PNGan members took little part in debate or decision making. The Council had very limited power and influence. In June 1964 the Council was replaced by a House of Assembly which had a majority of members elected from 69 open and 15 regional electorates. Open electorates covered fairly small local areas. Regional electorates were based on Administration districts. Members and ministers were appointed by the Administrator (the head of the colonial Administration who was appointed by the Australian government). Assembly legislation required the approval of the Administrator. In 1968 the second House of Assembly elections attracted 484 candidates, some of whom were attached to one of the six recently formed political parties. They were mainly younger and better educated than those in the first House of Assembly, and among them were the group which led the country to self-government and Independence. In 1964 and 1968 the Administration organized programs to train members in parliamentary procedures. In the period leading to Independence in 1975 the Assembly formulated the Constitution and gradually took over the reins of government. At Independence the House of Assembly became the National Parliament. In May 1969 a group of Tolai, the local people of the Gazelle Peninsula in East New Britain, formed the Mataungan Association (MAS) to oppose the setting up by the Administration of a multi-racial Gazelle Peninsula Local Government Council. Early members included Oscar Tammur, a Tolai member of the House of Assembly, and John Kaputin. The MAS boycotted the Council elections and organized demonstrations and mass meetings. In December 1969 violence broke out and some MAS members who physically assaulted supporters of the Council were jailed. The Melanesian Alliance (MA) was formed in February 1980 by a Bougainvillian, John Momis, and John Kapitun from East New Britain, with the support of four other members of the national parliament. Bernard Narakobi, from Wewak, has been a long-time prominent member. In its 1982 election manifesto the MA advocated redistribution of wealth, social justice and devolution of power to the provinces. Until the Bougainville crisis of 1989, the MA was most successful in the North Solomons – Momis’ own province. MA members of the national parliament representing North Solomons electorates have inevitably been involved in the negotiations concerning the Bougainville rebellion. By crossing the floor the MA helped to defeat the Somare government in March 1980 and then, in 1985, save the Somare government. In April 1985 Momis became Deputy Prime Minister. The strength of the MA has decreased in recent years and in October 1993 it was an Opposition party with only five parliamentary members.